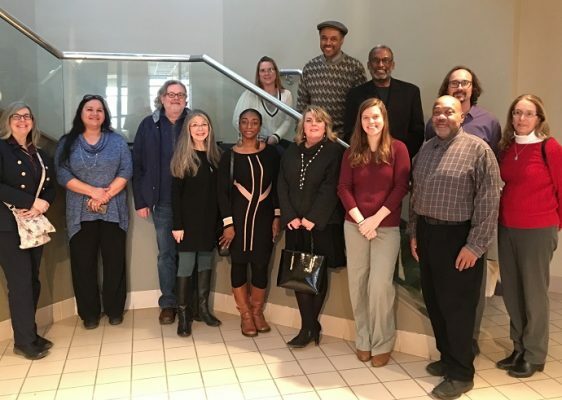 A number of faculty and staff from the Council on Diversity and Inclusion, the former Chancellor’s Workgroup on Diversity and Inclusion, and Sustainability Management toured the Skä•noñh—Great Law of Peace Center in December. The Skä·noñh—Great Law of Peace Center tells the story of the Haudenosaunee (Iroquois) and their founding at Onondaga Lake more than 1,000 years ago through the lens of the Onondaga Nation, the “Central Fire” of Six Nation Confederacy. Philip Arnold, associate professor and chair of the Department of Religion in the College of Arts and Sciences and founding director of the center, and his wife Sandy Bigtree, and two representatives from the Onondaga Nation, Betty Lyons, president and executive director of the American Indian Law Alliance, and Tadodaho Sidney Hill, led the tour. To learn more about the center, visit http://www.skanonhcenter.org/ or stop by the center at 6680 Onondaga Lake Parkway in Liverpool, New York.